Imagine not having to do anything on your wedding day but sit back and relax. 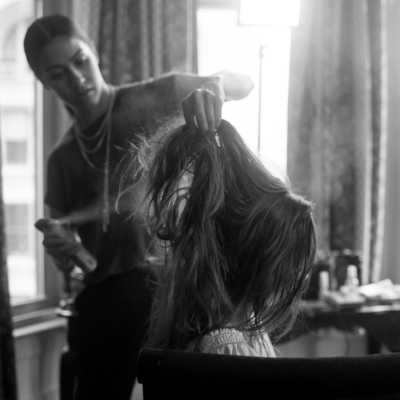 You would have your hair styled and your makeup applied in the comfort of your hotel suite or your own home. Your bridal party would be taken care of, and the moms and special attendants would all look their best, so your loved ones would be perfectly red carpet‐ready on the most special day of your life. And best of all—you wouldn’t have to worry about a thing. Being a part of the most important day of your life is what makes my job special. I love to make a bride feel her most beautiful for her day. To see my bridal rates, please click here. To view Frequently Asked Questions, click here. To secure your wedding date or schedule a trial, contact me to discuss availability. A non-refundable retainer must be provided to secure your date of 50% of the total wedding day services. If you are looking for someone to be there for you all day and field any issues that may occur, click here to view my Day Rate Experience packages that will keep me there for your entire wedding day to make sure that you are at your most beautiful all day long. Travel fees may apply to on location services. A non-refundable 50% retainer fee must be paid at time of booking to secure your wedding date and time. There is a $800 service minimum for on-location wedding day services. Please inquire for non-wedding rates. Photos before, during and after your ceremony will capture you and your family and friends in a range of joyous, emotional moments, and to keep it all together, you could have the assistance of your own personal stylist, who would work with your photographer to perfect the details of every one of your photos. Is your veil straight? Is your grandmother’s antique bracelet visible in the shot? Is your future partner’s hair sticking up in the wrong places? These are the things I would watch for and diligently maintain to ensure beautiful photos, and to keep you feeling relaxed and at ease. Do the grooms‐men need to have their ties tied? Hair styled? Do the sashes on the bridesmaids dresses need to be tied so they all look pretty and consistent? Do you need help bustling your dress while your bridesmaids enjoy the cocktail hour? Don’t make them work – let them enjoy it like you want them to! I’ll handle it. After the ceremony, you’re likely to have kissed off all your lipstick and cried a few tears, & you’ll definitely want to look perfect before you enter the reception, so after a special moment with your new partner, I’ll meet up with you again to adjust a few things. I can help take your veil out or add another adornment. I can take your hair from up to down or vice‐ versa. Want to change your makeup slightly for the reception? Give me 10 minutes and we’ll take you to the next level. Want to change your hair completely? No problem. Need help changing into that second dress and putting on your accessories? I can make that second entrance spectacular for you. From clasping a delicate necklace to buckling those over‐ priced stilettos – I do all these things, and so much more. I’ll take care of every beauty detail, from the time I put in the first curl to the moment the very last photo is taken. Day Rates are meant for brides who want to have an all inclusive styling and touch up experience. Spend part of your day getting styled then allow me to take care of your touch up needs throughout the day. Price is inclusive of time, travel, and services. Please contact me for a custom quote for your day rate experience. NOT SURE IF MY LUXURY DAY RATE EXPERIENCE OR A LA CARTE SERVICES ARE BETTER FOR YOU AND YOUR WEDDING? What is a trial and why do I need one? A trial is a time for us to get to know each other and ensure that we are the right match. It gives us time to meet with one another and create your ideal look for your wedding day. This will alleviate any stress for you because we will already have your wedding day look perfected before your big day to ensure that it is the look that you want. How far in advance of my wedding should I do my trial? I recommend doing your trial about 4-6 weeks in advance, but I can accommodate requests for any other timing. Do you use my makeup? Can you? I have my own kit stocked with professional grade products that I have rigorously tested to make sure that they will hold up under any conditions. If there is a particular product that you love or want to use, talk to me about it and we can discuss what is the best option for you on your day. Airbrush makeup is a special formulation of makeup that is applied using an air compressor and an airbrush gun. It gives a natural looking, flawless finish that feels very light on the skin and photographs beautifully. In the case of a large party or a party needing to be ready quicker than I can get everyone done, I will bring in artists of my caliber that can help out to make sure that everyone is ready on time and looks flawless. I am based in Chicago, but I love to travel and am willing to travel worldwide to accommodate clients. There is no gratuity included in my pricing, and it is completely voluntary on your part. To make it easier, I can add an industry standard 18% to your final invoice total so that you do not have to worry about cash the day of. I accept cash, credit cards, Paypal, or Chase QuickPay. How do I ensure that my date is booked? To secure your date, you must have a signed contract as well as pay a 50% retainer fee. The final balance will be due two weeks before your date.